I’m sure that if you’ve ever been pregnant, you’ve most likely heard of belly support bands and postpartum girdles. Maybe you’ve even heard of belly support taping. Since I’ve gotten my baby bump with my third pregnancy, I’ve noticed that I’m having discomforts that I didn’t have with my boys (I’m blaming it on carrying baby girl higher). My back was what bothered me with the boys (KT tape helps that too) but this time my abs and round ligaments feel like they are ripping apart at the seams. So I researched belly taping during pregnancy and found some helpful resources (I’ll list a couple at the bottom of this post). I am by no means a pro at this as it’s my first time experimenting with the tape but I’ve already found it to be beneficial so I wanted to share it with you all. Kinesiology taping (technical term) is usually used by physical therapists and chiropractors for sports injury patients but it has a very wide range of uses. I bought a roll of tape – the one in the main photo of this post – at Walmart. My first instinct was to look for it in the pharmacy section where they keep the ace wraps and knee support braces, but to no avail. My second stop was the sporting section. At my local Walmart, it was located near the yoga supplies and dumbbells. There was a variety of tapes but this is the one that I went with. It cost me about $13 for a roll of 20 strips. The box says that the “pro” tape – vs cotton – can be worn from 4-7 days. The cotton was slightly cheaper but doesn’t last as long. I’m still on my first taping but I’ll keep you posted on how long it holds up. The first link below is what I followed for the placement of the tape. It has several different scenarios for types of pain and how to use your tape to cope with that pain. I found the one that fit me best and taped according to the photos on the post. A word to the newbies, the tape doesn’t stick to itself so you have to make sure that the ends of the tape are in contact with skin. I did end up wasting a strip because it wasn’t stuck to me, but to a different piece of tape. 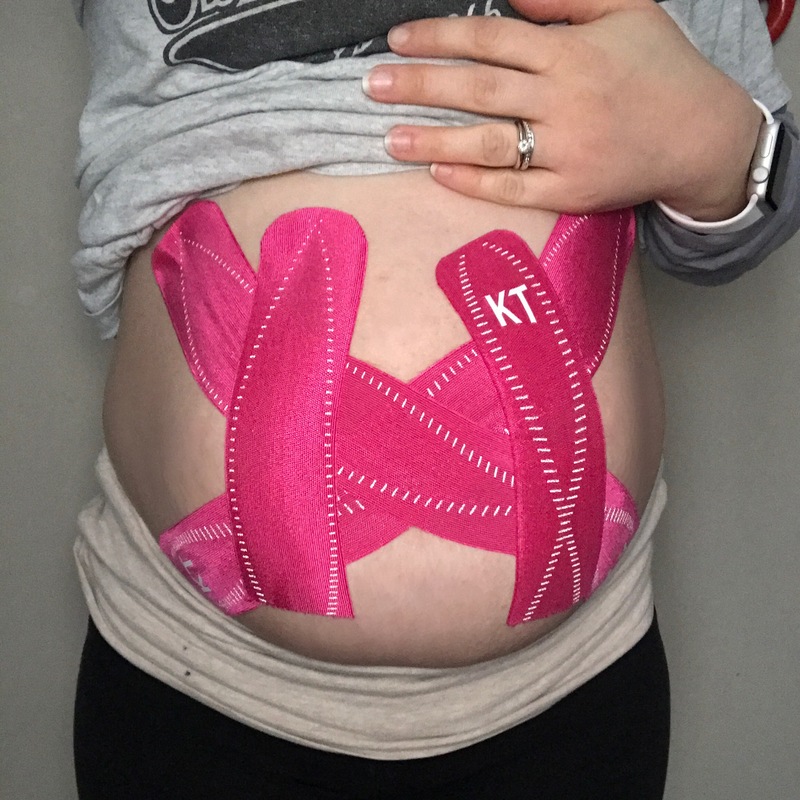 I got curious and started researching postpartum taping and found some ways to help heal (and prevent) diastisis recti, which is a big problem for me personally. I am hoping to try that once baby girl is born so that I can help my body heal properly. You can buy a girdle for that purpose also. The second link below has some great tips for that. I think I will prefer taping to wearing a belt or girdle because the tape doesn’t show under my clothes like a support belt would. I have very sensitive skin and I haven’t had a problem with the adhesive irritating me so far, no itching or redness. I’ve not attempted to remove my first taping yet, so I’m unsure of how painful or difficult it will be but I did read that baby oil is helpful in loosening the glue. I’ve had one shower and it held up to that. So far I have noticed that I don’t have that strain in my belly after a long day, though it does have other effects. It holds everything in place, which makes my insides more cramped for space. I have noticed that I can’t eat as much as I do without the tape, but smaller frequent meals are recommended during pregnancy anyway so it isn’t a total downfall. The benefits definitely outweigh the risks. This entry was posted in Recipes/Tutorials, Reviews. Bookmark the permalink. We are getting more and more clients that work with pregnant that use kinesio and seams to be having great results.